Greg: Jason, another Monday, another podcast. How are you? Jason: I’m great, Greg. How are you doing this morning? Greg: I am doing well. I looked back on some of the podcasts we’ve already recorded and looks like we’ve covered kitchens for probably a few weeks. I think we’re good there. I know there’s some other rooms around the house that people have questions about and always get oohh’s and aahh’s in a new house. Could you walk us through maybe a master bathroom and what you’re seeing goes into some of the new homes now? Greg: Guessing from your intro here, it sounds like you’re going to tell me master bathrooms might have gotten a wee bit bigger over the years? Jason: They have. They have. Not all of them have to be a huge, lavish space. We can still create a great master bath. A lot of our Norton Commons houses are a little bit smaller in nature, but we can still create that feel with the right finishes, that is. Greg: What has changed over the years? What are you seeing in master baths? Are there closets that are part of it? Is a closet a separate piece all together? Are we seeing stand up showers? Are we seeing tubs? What are some of the things that we’re looking at? Jason: One of the things that has exited master baths over the last few years is, I’m going to call it, a Jacuzzi tub, or a tub with a tub deck with tile around it. Most of those have exited stage left and have in come the free standing tub, or a pedestal-tub, or a claw-foot tub. Greg: Was that a matter of function, that they didn’t work as people had hoped? Or is it aesthetics that design has changed now and that people want a, not the built-in look, but sort of the free standing look? Greg: They require a little bit of upkeep, which it turns out, a lot of people weren’t really into. Jason: That’s right. That’s right. The soaker tub, we’re seeing a trend, and a little bit more modern finishes on the interior of our houses. Not real contemporary modern, but I’ll call it transitional, where you’ve got a mix of modern and traditional, that just a little bit more clean lines, so that that free standing tub fits that build a little bit better. It’s just a little bit cleaner look. Greg: I assume that people are still going to have a shower. You have a … Are these usually side by side, or the shower’s a little bit bigger? Are they tiled up? What are we seeing in the shower space? Jason: I’m going to call this a 50-50. Most people say, “I’m putting a tub in just because I have to for resale.” Then, the other 50% is like, “I’m going to use a shower. I want it big. I want it to have 2 shower heads.” We have done a lot of rain heads in the past. I think the trend now is going to more of a dual shower head to where 2 people can shower, technically, at the same time. Greg: The rain head was the shower head in the ceiling of a shower? Greg: Okay. Now you’re talking about opposite walls, as opposed to one wall in a ceiling? Jason: That’s right. We’ll design it. Still, people like the look of the rain head. It’s not as functional. We can put a diverter on, so you can use the wall or the rain head. Then, we still get a little demand for body sprays, 2-3 body sprays at stomach level that just wash a little bit more. Some people like them to spray across their back and help massage their back a little bit. Greg: This is to the spa experience you were talking about? That some people really, apparently want some relaxation time. Jason: That’s right. Go in there. Blare it. Turn up the hot. There you go. We’ll have a few people, too, as they’re soothing away in the hot bath or shower, we’ll put speakers in the bathroom, is a very popular request. We’ve actually done some waterproof speakers in the shower. Some people like to have their music, or listen to the news as they’re getting ready in the morning. Greg: Some people might never come out of the shower. It sounds like they might be late for work. Jason: That’s right. That’s right. Maybe they’ll set their alarm just a little bit earlier. Another thing that we’ve seen is travertine is still requested a little bit. Again, the vast majority of our showers are going with a carrera marble, or some type of white tile, very light and airy. Again, to the spa-like setting. Jason: Yeah. For the flooring and wall. Sometimes, we’ll do an accent wall in the shower that may have some decorative mosaics, or some kind of focal point. Yeah. Very clean. We always like to do something a little bit different on the floor. We might do a herringbone pattern or lay the floor on a diagonal, just so it spices up the master bath just a little bit more from the other bathrooms in the house. Greg: You’re talking about flooring, what is a typical floor in a bathroom look like? It’s going to be different than the shower floor, I assume? Jason: Yeah. You could use a little bit larger tile on the bathroom floor. A lot of times, we’re putting radiant heating under the tiles. Jason: Some people don’t like those toes to get cold in the morning. The heated tile floor’s a very popular request these days. Then, in the shower floor, usually, we’ll go for a smaller tile. That way, you get a little bit more grout, so it gives you a little bit more grip on that wet shower. Greg: Someone comes out of the shower. They soaked so far. Pre-shower soak, I guess, and they get in the shower, then they come out. Are we looking at a cabinet for one person, or a separate cabinet for another? Are we looking at different mirrors? What do the counters look like? 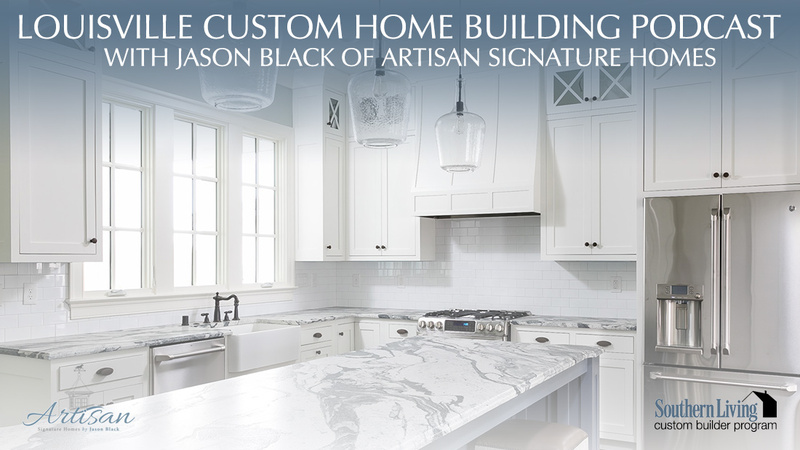 Jason: Counters, a lot of times, will have, again, white marble. We’re doing a lot of clean, white cabinets. In-set cabinets are very popular. No glaze on the cabinetry. Some type of quartsite, or marble or even Silestone. Something very clean, crisp as the counter top. Greg: I assume in the houses you’re building that there are 2, right? There’s one for his and hers? Jason: Yes. Sometimes, we’ll have a larger vanity that’s 6 to 8 foot long with 2 sinks, maybe a linen cabinet in the middle. A lot of times, we’ll have people just want, “My husband’s messier,” or the wife’s messy, we’ll have a separate his and her vanity. Jason: Sometimes, we’ll do a built-in medicine cabinet. Usually, we’ll have a built-in linen closet in the master’s as well for towels and linens. Then, almost always, we have a separate water closet. It’s just dual-use. Greg: A little privacy inside the bathroom? Greg: Okay. I asked in the beginning, and I’m curious, are people still putting closets, their walk-in closets, are they thinking of that as part of the master suit, master bathroom part of the house, or are they their own creature now? Do we need to come back maybe next week or the week after and talk about closets and what all is involved in a closet? Jason: Yeah. I think closets, again, are very important. We’d might save that for another episode. Jason: The access to the closet, most people like to directly access their closet from the master bath. We still have a few old school folks that like the closet separate from the bathroom. Most of the time, people want to go in the bathroom, close the door, shower, get ready, get dressed, and then come out of the closet. Greg: Wonderful. Then, in a few months, people are going to be able to see some examples of this kind of work, right? I guess they can follow along as you build it on Instagram and Facebook. I know we’ve talked about it before, but what’s coming up in the spring of next year that people can come in and check this out? Jason: We have our first ever Southern Living Showcase Home in Norton Commons. We’re going to have a very cool, spa-like master bath that will be connected to the closet. This will actually have a pass through closet to the laundry room. It gets 3 functions all in one space. Greg: There’s another question for a future podcast, where are people putting laundry rooms in new houses? Let’s mark that one down for a future podcast. Back to your showcase house. Jason: Yup. That’s going to be on the spring of 2016 in Norton Commons. All of the stuff we’ve been leading up to, talking about through the podcast, it’s great to hear about it, but I can’t wait to showcase it and meet the listeners, meet the readers of our blog, and they can come actually and walk through one of our houses. Greg: I’m having fun following along and looking at the pictures. I can’t wait til next year. As always, thanks again for your time. I’ll see you next week. Jason: Sounds good, Greg. Thank you.